This is an easy to make yummy salad. This is bit different from the usual salad I make. Here, I used red chilly powder instead of pepper powder. This addition gave a fine colour when it got mixed with the fruits. The fruit salad looked colourful as well it tasted too good. 1. Combine all the ingredients. Mix well. Thats an interesting and super delicious salad...awesome!! Salad looks superb n perfect!!! You are rocking....! Super.it looks very yummy. I have never made in this way.will give it a try.Thanks for sharingthe wi\onderful recipe. Thats an interesting and super delicious salad...awesome! !You are rocking dear....! Colorful and healthy fruit salad. I have never had spicy fruit salad before.Interesting. Looks very soo good and healthy. Healthy and yummy salad, even I love to add little spice to my fruit salad,liked ur version. Lovely salad, very common in our household in summer and even other seasons !!! Great click !!! ooh...love the salad which is like fruit chaat! this salad sounds really simple... i love the vibrant colors too! i love papayas, i just want to bite into its soft and tender texture! Wonderful! What a great place for us to try out Indian/Asian dishes. Thank you! what a great evening snack! 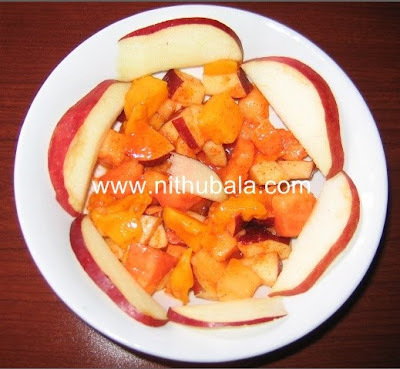 A simple spiced version of fruit salad! Looks nice Nithu! This looks delicious--light and refreshing. Thanks for sending it to Souper Sundays. I happened to check comments right before sending it out so I managed to work it and you other salad in this week. Love fruit and this ones a colorful fruit salad !!! I want to grab this now! that's a nice refreshing and delicious fruit mix; nice recipe! !